Dilatation of the aortic root and the ascending aorta is frequently encountered in patients with congenital heart disease (CHD) at initial presentation and during follow-up. Primary aortic dilatation is mainly associated with coarctation of the aorta (CoA), bicuspid aortic valve (BAV), and conotruncal abnormalities such as tetralogy of Fallot (TOF), pulmonary atresia with ventricular septal defect (PA/VSD), or truncus arteriosus. It can be a key feature in genetic syndromes with connective tissue disorders, such as Marfan, Loeys-Dietz, vascular Ehlers-Danlos, aneurysm-osteoarthritis, and Turner syndrome. 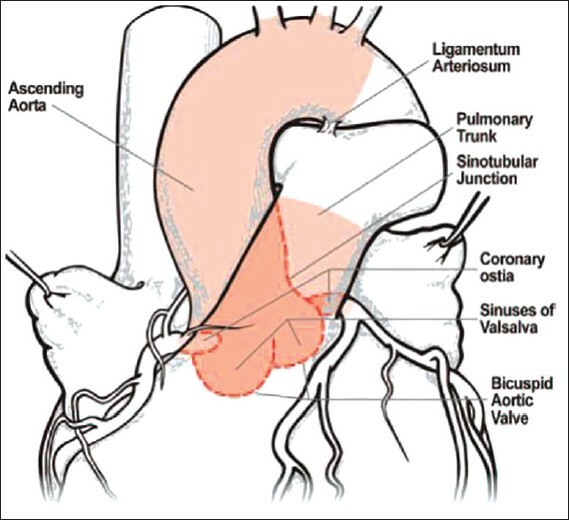 Secondary dilatation of the aortic root and to a lesser extent of the ascending aorta is seen after congenital cardiac surgery, when the original aortic root is replaced by a pulmonary autograft, as in the Ross operation, or modified as in the arterial switch operation (ASO) or systemic outflow tract reconstruction in single ventricle (SV) patients. In these situations the neo-aortic root consists mainly of pulmonary arterial root tissue introduced in the high-pressure left-sided system, often leading to dilatation in a time-dependent fashion. The magnitude of this problem continues to grow; as large cohorts of surgically treated patients survive into adulthood. Over the last decade, cumulative documentation of progressive aortic pathology in patients with CHD has been published. The objective of this review is to summarize the current knowledge on aortic pathophysiology, diagnostic tools, and options and guidelines for prevention and treatment of the dilated aortic root and ascending aorta, associated with CHD. The aortic dilatation in genetic syndromes will not be discussed, as it presents a very large topic with specific features, not always applicable to patients with CHD. All these mechanisms may help to understand some of the findings noted in the dilated aorta of children with CHD. The prevalence of a primary dilated aorta is high in association with CoA, BAV, and conotruncal abnormalities. Often the large aorta is already noted at the fetal echocardiography, and may be used as a distinct diagnostic feature. The evolution of the aortic size after birth will result from a combination of intrinsic pathology, associated malformations, surgical or catheter interventions, and control of risk factors later in life; they may all influence the natural course of the aortic dilatation. It has long been thought that the dilated aorta was a sole consequence of the altered blood flow through the eccentrically opening bicuspid valve and the resulting asymmetrical wall stress (the hemodynamic theory), but our understanding of this disease entity has evolved ever since. Many studies have pointed out that the dilatation results from a combination of intrinsic aortic wall modifications (the genetic theory) and hemodynamic changes induced by the bicuspid valve. , The marked heterogeneity of BAV disease leads to different phenotypes, resulting in a large clinical variation of BAV patients. The BAV inheritance pattern is autosomal dominant with incomplete penetrance of 9 to 30%. The male predominance of 3/1 and the association with Turner syndrome suggest an X-linked etiology. Mutations in the ACTA2 and NOTCH1 genes have been found in some BAV patients, but not the FBN1 gene associated with Marfan syndrome. Recent evidence has indicated that dilatation of the ascending aorta occurs as a consequence of aortic medial degeneration, similar to the one seen in connective tissue disorders resulting from apoptosis of neural crest derivatives. , Immunohistochemistry studies in the ascending aorta of BAV patients show non-inflammatory loss of VSMCs with multifocal apoptosis, in contrast with the significant inflammation and cystic medial necrosis that is usually found in the dilated aortas of patients with tricuspid aortic (TAV) valves. BAV patients have been found to show a genetic profile characterized by over-expression of polymorphisms of matrix metalloproteinase-9 (MMP-9) and MMP-2, and reduced expression of MMP-14, compared to patients with TAV and dilated aorta. ,, The extracellular matrix plays an important role in maintaining the structural integrity of the vascular wall, and is under the balanced control of MMPs and its specific tissue inhibitors. A disturbed balance with increased MMP activity, as found in BAV aortas, can lead to apoptosis and degeneration of the aortic wall, and predispose to aneurysm formation. The discovery of true detrimental flow patterns and pathological genes in association with aortic dilatation in BAV patients may help to identify high-risk geno-phenotypes, improving risk stratification and treatment choice. TOF is the most common form of cyanotic CHD and accounts for 10% of all congenital heart defects. Dilatation of the proximal aorta is a common feature in patients with unrepaired TOF and PA/VSD, which can already be observed at fetal echocardiography. The aorta in TOF is dilated mainly at the root, tapering down towards the ascending aorta; the aortic arch is usually of normal size. Corrective surgery has dramatically improved long-term prognosis, with nearly 90% of patients now surviving well into adulthood. However, persistent aortic root dilatation is increasingly reported in adult patients, years after corrective surgery. Single case reports of progressive aortic dilatation long after repair of TOF began appearing in the early 1970s. In 1982 Capelli and Somerville mentioned persistence of a large aortic root, but considered it an acquired feature due to long-standing volume overload by years of aortopulmonary shunts before complete repair, and suggested that earlier repair in the first decade of life might prevent this complication. In 1997 the first series on progressive aortic root dilatation many years after TOF repair was published by the Mayo Clinic group. Despite excellent clinical results, a substantial cohort of patients developed progressive aortic dilatation and subsequent aortic valve incompetence, necessitating reoperation on the aortic root. We and others have demonstrated a significant regression of indexed aortic root diameters over time after early repair in infancy, with a chance of normalizing the initially dilated root within 7 to 8 years. , In a homogenous cohort of TOF patients repaired early in infancy, we found that the ascending aortic size really decreases with growth of the patient during the first years after surgery, irrespective of the total histology score at operation  [Figure 3]. These findings support the presumption that mitigation of the transaortic flow by early surgical repair of TOF triggers a remodeling process that may interrupt the progression of the limited histological alterations of the aortic root related to increased aortic stiffness, thus preventing late aortic dilatation. The real prevalence and severity of dilated aortic root and its associated complications in the adult TOF population remain to be defined, as more evidence emerges that not all patients develop important aortic dilatation. In a recent review Mongeon et al. found, in adult patients, 35 years after repair of TOF at a mean of 7 years of age, an aortic dimension of ≥40 mm in 29%, but only an observed-to-expected aortic root dimension ratio of >1.5 in 7%, and moderate to severe aortic regurgitation in 3.5% of patients. Only 3 cases of aortic dissection late after TOF repair have been described in the literature so far, all in severely dilated aortas of >70 mm. ,, In the section on guidelines for treatment, these findings will be taken into account. In this section we will consider the occurrence of dilatation of the aortic root, and to a lesser extent of the ascending aorta, after congenital cardiac surgery, by which the original aortic root is replaced by a pulmonary autograft, as in the Ross operation, or modified as in the ASO or systemic outflow tract reconstruction in SV patients. In these situations the neo-aortic root consists mainly of pulmonary arterial root tissue introduced in the high-pressure left-sided system, often leading to dilatation in a time-dependent fashion. In contrast with the primary aortic dilatation, the literature on secondary aortic dilatation is less extensive, probably because this feature only started to emerge as a clinical problem during the last decade. Since the introduction by Sir Donald Ross in 1967 of the Ross procedure, comprising aortic replacement by the pulmonary autograft, this operation has gained widespread applicability both in children and adults with congenital aortic valve disease. Technically, the pulmonary autograft can be implanted as a full root replacement, or as a subcoronary replacement, inserting the pulmonary autograft as an inclusion cylinder in the existing aortic root. The right ventricular outflow tract reconstruction is mostly performed with a pulmonary homograft or biological xenograft root. Risk factors for neo-aortic root dilatation have been searched for, in order to improve the long-term results and diminish the risk for late neo-aortic valve failure. Over the past two decades, the ASO has become the procedure of choice for repair of transposition of the great arteries in neonates and young infants. , The ASO leads to anatomic correction, in contrast to atrial switch operation, and thus avoids the long-term complications of systemic atrioventricular valve regurgitation and ventricular failure. However, several factors are of potential concern for the evolution of the neo-aortic root later in life. After ASO, the native pulmonary valve and root assume the role of systemic arterial valve and root. As was described previously, the pulmonary and aortic valves are macroscopically indistinguishable at birth, but the aortic valve develops more collagen and elastin fibers in the perinatal period. It has been demonstrated, however, that the structural changes in the medial connective tissue of the pulmonary trunk, that normally accompany decreasing pulmonary arterial pressure in infants, do not occur if pressure in the native pulmonary trunk remains high. This finding may further stimulate to perform the ASO in transposition with intact septum during the first days of life, in order to improve the tissue characteristics of the neo-aortic valve. However, even after early ASO, distensibility of the aortic root is reduced, leading to increased left ventricular mass and diastolic dysfunction. , This finding was strongly associated with age, suggesting the usefulness of long-term follow-up studies for early onset of degenerative cardiovascular disease. In medium- and long-term follow-up studies after ASO, several risk factors for late neo-aortic root dilatation and aortic regurgitation have emerged. The presence of a VSD, previous pulmonary artery banding, older age at repair, and the association with CoA are patients factors associated with increased neo-aortic dilatation. ,,, Technical factors such as acute angulation of the aortic arch after ASO  and closure of the VSD through the pulmonary artery,  have been associated with late aortic regurgitation and aortic dilatation in some reports. Because the factor "time" is the principal determinant of late neo-aortic valve dysfunction and root dilatation, strict serial surveillance after ASO is mandatory. Since the introduction of staged procedures for patients with SV physiology two decades ago, an increasing number of survivors with a Fontan circulation grow into adolescence and adulthood. In a study with a median follow-up of 9 years after Fontan completion, neo-aortic root progressively dilated out of proportion to body size over time, with 98% of patients having a root z-value of >2 at most recent follow-up. The authors concluded that early volume unloading had no beneficial impact on the size of the neo-aortic root. Only a few case reports of quickly progressive neo-aortic root dilatation necessitating surgical intervention, have been published. ,, In the majority of cases, a valve-sparing operation was attempted, with variable results. The cornerstone investigation in all pathologies described above, remains transthoracic echocardiography (TTE). It is the first line tool to delineate the exact valve anatomy, valve function, severity of regurgitation, and ventricular function. Measurement of the aortic root needs to be performed at four levels during end-diastole: Aortic annulus, sinus, sinotubular junction, and proximal ascending aorta. It may be difficult to appreciate the distal ascending aortic diameter on TTE. Sometimes better image quality can be obtained with transesophageal echocardiography, but usually some form of sedation is needed, and the mid-segment of the aorta cannot be completely viewed. When performing serial follow-up, it is important to always compare the measurement obtained by the same diagnostic technique. Guidelines for the follow-up and surgical treatment of adult patients with valvular heart and thoracic aortic disease are well established, and regularly updated. ,, In these guidelines, only BAV with thoracic aorta dilatation receives special attention. All guidelines are based on diameters; aortic size index is never used up to now. 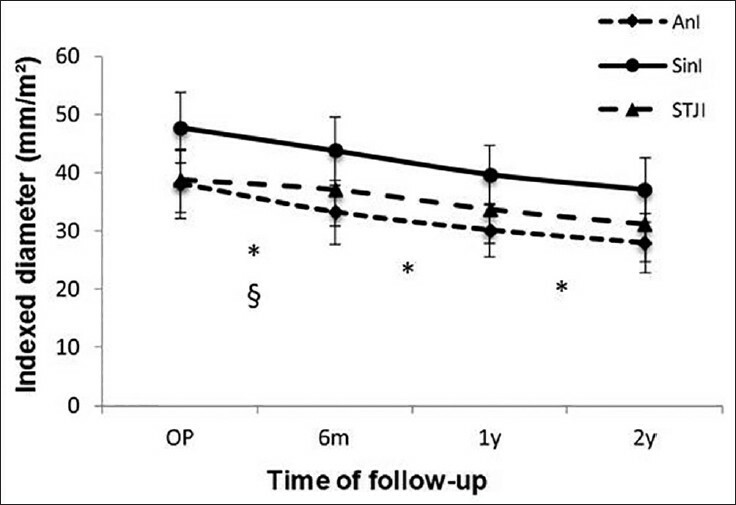 Regarding follow-up, all patients with an aortic diameter of >40 mm should be follow-up regularly. When the diameter is >45 mm, and patients have a family history of dissection or show rapid progression, yearly imaging is mandated. In the absence of guidelines for the other pathologies previously discussed, a pragmatic attitude is probably appropriate: As no case reports have appeared about ruptured aortas <55 mm in adult sized patients, this diameter should be used as a cut-off. A diameter of >60 mm is considered the hinge point for the ascending aorta, above which the chance for rupture increases exponentially. In small children, rapid progression in size may urge faster intervention. The usefulness of medical treatment to prevent aortic expansion in normotensive patients with primary or secondary aortic dilatation related to CHD, is controversial. Despite a larger cohort of patients survives into adulthood, a paucity of data remains on the applicability of any medical therapy in the CHD patient group. The only existing guidelines are restricted to patients with Marfan disease with dilated aorta. As some histological and functional similarities have been shown between the aortas in CHD patients and those with Marfan syndrome, similar medical therapies have been recommended, however without strong clinical evidence. It is clear that multicenter trials are needed to study medical therapy in patients with CHD-related aortopathy. Valve-sparing procedures are usually preferred in growing children and young adults, whenever possible. Surgery should be performed in centers with experience in thoracic aortic surgery. Extensive discussion on this topic can be found in the literature. Dilatation of the aortic root and the ascending aorta is frequently encountered in patients with CHD at initial presentation and during follow-up. As large cohorts of surgically treated patients survive into adulthood, more retrospective studies emerge discussing progressive aortopathy in patients with CHD. Specific guidelines about indication for medical and surgical treatment are largely lacking. Future recommendations should include indexed size measurements, adapted to growing children. Niwa K. Aortic root dilatation in tetralogy of Fallot long-term after repair - histology of the aorta in tetralogy of Fallot: Evidence of intrinsic aortopathy. Int J Cardiol 2005;103:117-9. Snider P, Olaopa M, Firulli AB, Conway SJ. Cardiovascular development and the colonizing cardiac neural crest lineage. ScientificWorldJournal 2007;7:1090-113. Okamoto N, Akimoto N, Hidaka N, Shoji S, Sumida H. Formal genesis of the outflow tracts of the heart revisited: Previous works in the light of recent observations. Congenit Anom (Kyoto) 2010;50:141-58. Waldo KL, Kumiski DH, Wallis KT, Stadt HA, Hutson MR, Platt DH, et al. Conotruncal myocardium arises from a secondary heart field. Development 2001;128:3179-88. Moorman AF, Christoffels VM. Cardiac chamber formation: Development, genes and evolution. Physiol Rev 2003;83:1223-67. Burcke RD, Wang D, Jones VM. Ontogeny of vessel wall components in the outflow tract of the chick. Anat Embryol (Berl) 1994;189:447-56. Waldo KL, Huston MR, Stadt HA, Zdanowics M, Zdanowics J, Kirby ML. 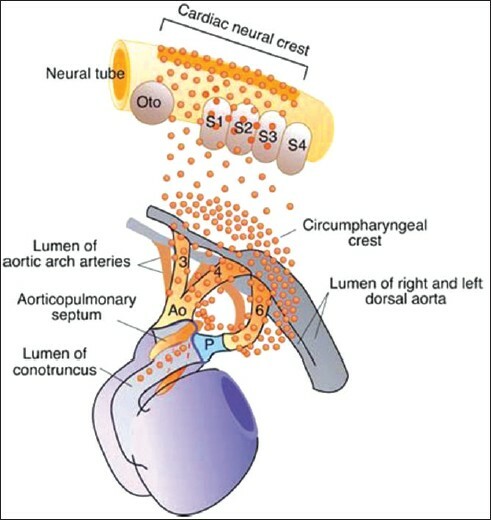 Cardiac neural crest is necessary for normal addition of the myocardium to the arterial pole from the second heart field. Dev Biol 2005;281:66-77. Bensley JG, De Matteo R, Harding R, Black MJ. Preterm birth with antenatal corticosteroid administration has injurious and persistent effects on the structure and composition of the aorta and pulmonary artery. Pediatr Res 2012;71:150-5. Labella FS, Lindsay WG. The structure of human aortic elastin as influenced by age. J Gerontol 1963;18:111-8. Bendeck MP, Keeley FW, Langille BL. Perinatal accumulation of arterial wall constituents: Relation to hemodynamic changes at birth. Am J Physiol 1994;267:H2268-79. Kelleher CM, McLean SE, Mecham RP. Vascular extracellular matrix and aortic development. Curr Top Dev Biol 2004;62:153-88. Parks WC, Roby JD, Wu LC, Grosso LE. Cellular expression of tropoelastin mRNA splice variants. Matrix 1992;12:156-62. Campbell M, Polani PE. The etiology of coarctation of the aorta. Lancet 1961;1:463-8. Silversides CK, Kiess M, Beauchesne L, Bradley T, Connelly M, Niwa K, et al. Canadian Cardiovascular Society 2009 Consensus Conference on the management of adults with congenital heart disease: Outflow tract obstruction, coarctation of the aorta, tetralogy of Fallot, Ebstein anomaly and Marfan's syndrome. Can J Cardiol 2010;26:e80-97. Stewart AB, Ahmed R, Travill CM, Newman CG. Coarctation of the aorta life and health 20-44 years after surgical repair. Br Heart J 1993;69:65-70. Brouwer RM, Erasmus ME, Ebels T, Eijgelaar A. Influence of age on survival, late hypertension, and recoarctation in elective aortic coarctation repair. Including long-term results after elective aortic coarctation repair with a follow-up from 25 to 44 years. J Thorac Cardiovasc Surg 1994;108:525-31. Sehested J, Baandrup U, Mikkelsen E. Different reactivity and structure of the prestenotic and poststenotic aorta in human coarctation. Implications for baroreceptor function. Circulation 1982;65:1060-5.
de Divitiis M, Pilla C, Kattenhorn M, Zadinello M, Donald A, Leeson P, et al. Vascular dysfunction after repair of coarctation of the aorta: Impact on early surgery. Circulation 2001;104:I165-70. Friedman T, Mani A, Elefteriades JA. Bicuspid aortic valve: Clinical approach and scientific review of a common clinical entity. Expert Rev Cardiovasc Ther 2008;6:235-48. Jackson V, Olsson C, Eriksson P, Franco-Cereceda A. Aortic dimensions in patients with bicuspid and tricuspid aortic valves. J Thorac Cardiovasc Surg 2013;146:605-10. Della Corte A, Bancone C, Quarto C, Dialetto G, Covino FE, Scardone M, et al. Predictors of ascending aortic dilatation with bicuspid aortic valve: A wide spectrum of disease expression. Eur J Cardiothorac Surg 2007;31:397-405. Girdauskas E, Borger MA, Secknus MA, Girdauskas G, Kuntze T. Is aortopathy in bicuspid aortic valve disease a congenital defect or a result of abnormal hemodynamics? A critical reappraisal of a one-sided argument. Eur J Cardiothorac Surg 2011;39:809-14. Huntington K, Hunter AG, Chan KL. A prospective study to assess the frequency of familial clustering of congenital bicuspid valve. J Am Coll Cardiol 1997;30:1809-12. Niwa K, Perloff JK, Bhuta SM, Laks H, Drinkwater DC, Child JS, et al. Structural abnormalities of great arterial walls in congenital heart disease: Light and electron microscopic analyses. Circulation 2001;103:393-400. Yetman AT, Graham T. The dilated aorta in patients with congenital cardiac defects. J Am Coll Cardiol 2009;53:461-7. Balistreri CR, Pisano C, Candore G, Maresi E, Codispoti M, Ruvolo G. Focus on the unique mechanisms involved in thoracic aortic aneurysm formation in bicuspid aortic valve versus tricuspid aortic valve patients: Clinical implications of a pilot study. Eur J Cardiothorac Surg 2013;43:e180-6. Ikonomidis JS, Jones JA, Barbour JR, Stroud RE, Clark LL, Kaplan BS, et al. Expression of matrix metalloproteinases and endogenous inhibitors within ascending aortic aneurysms of patients with bicuspid or tricuspid aortic valves. J Thorac Cardiovasc Surg 2007;133:1028-36. Boyum J, Fellinger EK, Schmoker JD, Tromblev L, McPartland K, Ittleman FP, et al. Matrix metalloproteinase activity in thoracic aortic aneurysms associated with bicuspid and tricuspid aortic valves. J Thorac Cardiovasc Surg 2004;127:686-91. Yasuda H, Nakatani S, Stugaard M, Tsujita-Kuroda Y, Bando K, Kobayashi J, et al. Failure to prevent progressive dilation of ascending aorta by aortic valve replacement in patients with bicuspid aortic valve: Comparison with tricuspid aortic valve. Circulation 2003;108:II291-4. Della Corte A, Quarto C, Bancone C, Castaldo C, Di Meglio F, Nurzynska D, et al. Spatiotemporal patterns of smooth muscle cell changes in ascending aortic dilatation with bicuspid and tricuspid aortic valve stenosis: Focus on cell-matrix signaling. J Thorac Cardiovasc Surg 2008;135:8-18. Hope MD, Hope TA, Meadows AK, Ordovas KG, Urbania TH, Alley MT, et al. Bicuspid aortic valve: Four-dimensional MR evaluation of ascending aortic systolic flow patterns. Radiology 2010;255:53-61. Mahadevia R, Barker AJ, Schnell S, Entezari P, Kansal P, Fedak PW, et al. Bicuspid aortic cusp fusion morphology alters aortic three-dimensional outflow patterns, wall shear stress, and expression of aortopathy. Circulation 2014;129:673-82. Jackson V, Petrini J, Caidahl K, Eriksson MJ, Liska J, Eriksson P, et al. Bicuspid aortic valve leaflet morphology in relation to aortic root morphology: A study of 300 patients undergoing open-heart surgery. Eur J Cardiothorac Surg 2011;40:e118-24. Capelli H, Ross D, Somerville J. Aortic regurgitation in tetrad of Fallot and pulmonary atresia. Am J Cardiol 1982;49:1979-83. Dodds GA 3rd, Warnes CA, Danielson GK. Aortic valve replacement after repair of pulmonary atresia and ventricular septal defect or tetralogy of Fallot. J Thorac Cardiovasc Surg 1997;113:736-41. Tan JL, Davlouros PA, McCarthy KP, Gatzoulis MA, Ho SY. Intrinsic histological abnormalities of aortic root and ascending aorta in tetralogy of Fallot: Evidence of causative mechanism for aortic dilatation and aortopathy. Circulation 2005; 112:961-8. Chowdhury UK, Mishra AK, Ray R, Kalaivani M, Reddy SM, Venugopal P. Histopathologic changes in ascending aorta and risk factors related to histopathologic conditions and aortic dilatation in patients with tetralogy of Fallot. J Thorac Cardiovasc Surg 2008;135:69-77. Niwa K, Siu SC, Webb GD, Gatzoulis MA. Progressive aortic root dilatation in adults late after repair of tetralogy of Fallot. Circulation 2002;106:1374-8. Goldmuntz E, Clark BJ, Mitchell LE, Jaward AF, Cuneo BF, Reed L, et al. Frequency of 22q11 deletions in patients with conotruncal defects. J Am Coll Cardiol 1998;32:492-8. Chowdhury UK, Mishra AK, Balakrishnan P, Sharma S, Kabra M, Ray R, et al. Role of fibrillin-1 genetic mutations and polymorphism in aortic dilatation in patients undergoing intracardiac repair of tetralogy of Fallot. J Thorac Cardiovasc Surg 2008;136:757-66. François K, Creytens D, De Groote K, Panzer J, Vandekerckhove K, De Wolf D, et al. Analysis of the aortic root in patients with tetralogy of Fallot undergoing early repair: Form follows function. J Thorac Cardiovasc Surg 2014;148:1555-9. Senzaki H, Iwamoto Y, Ishido H, Matsunaga T, Taketazu M, Kobayashi T, et al. Arterial haemodynamics in patients after repair of tetralogy of Fallot: Influence on left ventricular after load and aortic dilatation. Heart 2008;94:70-4. Cheung YF, Ou X, Wong SJ. Central and peripheral arterial stiffness in patients after surgical repair of tetralogy of Fallot: Implications for aortic root dilatation. Heart 2006;92:1827-30. Chong WY, Wong WH, Chiu CS, Cheung YF. Aortic root dilation and aortic elastic properties in children after repair of tetralogy of Fallot. Am J Cardiol 2006;97:905-9. François K, Zaqout M, Bové T, Vandekerckhove K, De Groote K, Panzer J, et al. The fate of the aortic root after early repair of tetralogy of Fallot. Eur J Cardiothorac Surg 2010;37:1254-8. Bhat AH, Smith CJ, Hawker RE. Late aortic root dilatation in tetralogy of Fallot may be prevented by early repair in infancy. Pediatr Cardiol 2004;25:654-9. Mongeon FP, Gurvitz MZ, Broberg CS, Aboulhosn J, Opotowsky AR, Kay JD, et al. Alliance for Adult Research in Congenital Cardiology (AARCC). Aortic root dilatation in adults with surgically repaired tetralogy of Fallot: A multicenter cross-sectional study. Circulation 2013;127:172-9. Kim WH, Seo JW, Kim SJ, Song J, Lee J, Na CY. Aortic dissection late after repair of tetralogy of Fallot. Int J Cardiol 2005;101:515-6. Rathi VK, Doyle M, Williams RB, Yamrozik J, Shannon RP, Biederman RW. Massive aortic aneurysm and dissection in repaired tetralogy of Fallot; diagnosis by cardiovascular magnetic resonance imaging. Int J Cardiol 2005;101:169-70. Konstantinov IE, Fricke TA, d'Udekem Y, Robertson T. Aortic dissection and rupture in adolescents after tetralogy of Fallot repair. J Thorac Cardiovasc Surg 2010;140:e71-3. Ross DN. Replacement of aortic and mitral valves with a pulmonary autograft. Lancet 1967;2:956-8. Charitos EI, Takkenberg JJ, Hanke T, Gorski A, Botha C, Franke U, et al. Reoperations on the pulmonary autograft and pulmonary homograft after the Ross procedures: An update on the German Dutch Ross Registry. J Thorac Cardiovasc Surg 2012;144:813-21. Brancaccio G, Polito A, Hoxha S, Gandolfo F, Giannico S, Amodeo A, et al. The Ross procedure in patients aged less than 18 years: The midterm results. J Thorac Cardiovasc Surg 2014;147:383-8. Charitos EI, Hanke T, Stierle U, Robinson DR, Bogers AJ, Hemmer W, et al. German-Dutch Ross Registry. Autograft reinforcement to preserve autograft function after the Ross procedure: A report from the german-dutch ross registry. Circulation 2009;120:S146-54. Goda M, Gewillig M, Eyskens B, Heying R, Cools B, Rega F, et al. Mechanism of autograft insufficiency after the Ross operation in children. Cardiol Young 2013;23:523-9. Elkins RC, Lane MM, McCue C. Ross operation in children: Late results. J Heart Valve Dis 2001;10:736-41. Matsuki O, Okita Y, Almeida RS, McGoldrick JP, Hooper TL, Robles A, et al. Two decades' experience with aortic valve replacement with pulmonary autograft. J Thorac Cardiovasc Surg 1988;95:705-11. Alsoufi B, Fadel B, Bulbul Z, Al-Ahmadi M, Al-Fayyadh M, Kolloghlian A, et al. Cardiac reoperations following the Ross procedure in children: Spectrum of surgery and reoperation results. Eur J Cardiothorac Surg 2012;42:25-30. Hörer J, Hanke T, Stierle U, Takkenberg JJ, Bogers AJ, Hemmer W, et al. Neoaortic root diameters and aortic regurgitation in children after the Ross operation. Ann Thorac Surg 2009;88:594-600. Hokken RB, Bogers AJ, Taams MA, Schiks-Berghourt MB, van Herwerden LA, Roelandt JR, et al. Does the pulmonary autograft in the aortic position in adults increase in diameter? An echocardiography study. J Thorac Cardiovasc Surg 1997;113:667-74. Solymar L, Südow G, Holmgren D. Increase in size of the pulmonary autograft after the Ross operation in children: Growth or dilation? J Thorac Cardiovasc Surg 2000;119:4-9. Schoof PH, Takkenberg JJ, van Suylen RJ, Zondervan PE, Hazekamp MG, Dion RA, et al. Degeneration of the pulmonary autograft: An explant study. J Thorac Cardiovasc Surg 2006;132:1426-32. David TE, Omran A, Ivanov J, Armstrong S, de Sa MP, Sonnenberg B, et al. Dilation of the pulmonary autograft after the Ross procedure. J Thorac Cardiovasc Surg 2000;119:210-20. Al Rashidi F, Bhat M, Höglund P, Meurling C, Roijer A, Koul B. The modified Ross operation using a Dacron prosthetic vascular jacket does prevent pulmonary autograft dilatation at 4.5-year follow-up. Eur J Cardiothorac Surg 2010;37:928-33. Wernovsky G, Mayer JE Jr, Jonas RA, Hanley FL, Blackstone EH, Kirklin JW, et al. Factors influencing early and late outcome of the arterial switch operation for transposition of the great arteries. J Thorac Cardiovasc Surg 1995;109:289-301. Prêtre R, Tamisier D, Bonhoeffer P, Mauriat P, Pouard P, Sidi D, et al. Results of the arterial switch operation in neonates with transposed great arteries. Lancet 2001;357:1826-30. Heath D, Wood EH, DuShane JW, Edwards JE. The structure of the pulmonary trunk at different ages and in case of pulmonary hypertension and pulmonary stenosis. J Pathol Bacteriol 1959;77:443-56. Murakami T, Nakazawa M, Momma K, Imai Y. Impaired distensibility of the neoaorta after arterial switch procedure. Ann Thorac Surg 2000;70:1907-10. Voges I, Jerosch-Herold M, Hedderich J, Hart C, Petko C, Scheewe J, et al. Implications of early aortic stiffening in patients with transposition of the great arteries after arterial switch operation. Circ Cardiovasc Imaging 2013;6:245-53. Marino BS, Wernovsky G, McElhinney DB, Jawad A, Kreb DL, Mantel SF, et al. Neo-aortic valvar function after the arterial switch. Cardiol Young 2006;16:481-9. Schwartz ML, Gauvreau K, del Nido P, Mayer GE, Colan SD. Long-term predictors of aortic root dilation and aortic regurgitation after arterial switch operation. Circulation 2004;110:II128-32. Losay J, Touchot A, Capderou A, Piot JD, Belli E, Planché C, et al. Aortic valve regurgitation after arterial switch operation for transposition of the great arteries: Incidence, risk factors, and outcome. J Am Coll Cardiol 2006;47:2057-62. Bové T, De Meulder F, Vandenplas G, De Groote K, Panzer J, Suys B, et al. Midterm assessment of the reconstructed arteries after the arterial switch operation. Ann Thorac Surg 2008;85:823-30. Agnoletti G, Ou P, Celermajer DS, Boudjemline Y, Marini D, Bonnet D, et al. Acute angulation of the aortic arch predisposes a patient to ascending aortic dilatation and aortic regurgitation late after the arterial switch operation for transposition of the great arteries. J Thorac Cardiovasc Surg 2008;135:568-72. Vandekerckhove KD, Blom NA, Lalezari S, Koolbergen DR, Rijlaarsdam ME, Hazekamp MG. Long-term follow-up of arterial switch operation with an emphasis on function and dimensions of left ventricle and aorta. Eur J Cardiothorac Surg 2009;35:582-7. Hutter PA, Thomeer BJ, Jansen P, Hitchcock JF, Faber JA, Meijboom EJ, et al. Fate of the aortic root after arterial switch operation. Eur J Cardiothorac Surg 2001;20:82-8. Schwarz F, Blaschczok HC, Sinzobahamvya N, Sata S, Korn F, Weber A, et al. The Taussig-Bing anomaly: Long-term results. Eur J Cardiothorac Surg 2013;44:821-7. Spadotto V, Uemura H, Uebing A. Successful Bentall procedure in a patient with a Fontan circulation. Interact Cardiovasc Thorac Surg 2014;19:520-2. Kojima T, Kuwata S, Kurishima C, Iwamoto Y, Saiki H, Ishido H, et al. Aortic root dilatation and aortic stiffness in patients with single ventricular circulation. Circ J 2014;78:2507-11. Okamoto RJ, Xu H, Kouchoukos NT, Moon MR, Sundt TM 3 rd . The influence of mechanical properties on wall stress and distensibility of the dilated ascending aorta. J Thorac Cardiovasc Surg 2003;126:842-50. Chin AJ, Barber G, Helton JG, Alboliras ET, Aglira BA, Pigott JD, et al. Fate of the pulmonic valve after proximal pulmonary artery-to-ascending aorta anastomosis for aortic outflow obstruction. Am J Cardiol 1988;62:435-8. Cohen MS, Marino BS, McElhinney DB, Robbers-Visser D, van der Woerd W, Gaynor JW, et al. Neo-aortic root dilation and valve regurgitation up to 21 years after staged reconstruction for hypoplastic left heart syndrome. J Am Coll Cardiol 2003;42:533-40. Erez E, Tam VK, Galliani C, Lashus A, Doublin NA, Peretti J. Valve-sparing aortic root replacement for patients with a Fontan circulation. J Heart Valve Dis 2012;21:175-80. Pizarro C, Baffa JM, Derby CD, Krieger PA. Valve-sparing neo-aortic root replacement after Fontan completion for hypoplastic left heart syndrome. J Thorac Cardiovasc Surg 2011;141:1083-4. Shuhaiber JH, Patel V, Husayni T, El-Zein C, Barth MJ, Ilbawi MN. Repair of symptomatic neoaortic aneurysm after third-stage palliation for hypoplastic left heart syndrome. J Thorac Cardiovasc Surg 2006;131:478-9. Elefteriades JA, Farkas EA. Thoracic aortic aneurysm: Clinically pertinent controversies and uncertainties. J Am Coll Cardiol 2010;55:841-57. Roman MJ, Devereux RB, Kramer-Fox R, O'Loughlin J. Two-dimensional echocardiographic aortic root dimensions in normal children and adults. Am J Cardiol 1989;64:507-12. Davies RR, Gallo A, Coady MA, Tellides G, Botta DM, Burke B, et al. Novel measurement of relative aortic size predicts rupture of thoracic aortic aneurysms. Ann Thorac Surg 2006;81:169-77. Daubeney PE, Blackstone EH, Weintraub RG, Slavik Z, Scanlon J, Webber SA. Relationship of the dimension of cardiac structures to body size: An echocardiographic study in normal infants and children. Cardiol Young 1999;9:402-10. Lang RM, Bierig M, Devereux RB, Flachskampf FA, Foster E, Pellikka PA, et al. Chamber Quantification Writing Group; American Society of Echocardiography's Guidelines and Standards Committee; European Association of Echocardiography. Recommendations for chamber quantification: A report from the American Society of Echocardiography's Guidelines and Standards Committee and the Chamber Quantification Writing Group, developed in conjunction with the European Association of Echocardiography, a branch of the European Society of Cardiology. J Am Soc Echocardiogr 2005;18:1440-63. Nishimura RA, Otto CM, Bonow RO, Carabello BA, Erwin JP 3rd, Guyton RA, et al. American College of Cardiology/American Heart Association Task Force on Practice Guidelines. 2014 AHA/ACC Guideline for the management of patients with valvular heart disease: A report of the American College of Cardiology/American Heart Association Task Force on Practice Guidelines. J Am Coll Cardiol 2014;63:e57-185. Vahanian A, Alfieri O, Andreotti F, Antunes MJ, Baron-Esquivias G, Baumgartner H, et al. ESC Committee for Practice Guidelines (CPG); Joint Task Force on the Management of Valvular Heart Disease of the European Society of Cardiology (ESC); European Association for Cardio-Thoracic Surgery (EACTS). Guidelines on the management of valvular heart disease (version 2012): The Joint Task Force on the Management of Valvular Heart Disease of the European Society of Cardiology (ESC) and the European Association for Cardio-Thoracic Surgery (EACTS). Eur J Cardiothorac Surg 2012;42:S1-44. Hiratzka LF, Bakris GL, Beckman JA, Bersin RM, Carr VF, Casey DE Jr, et al. American College of Cardiology Foundation/American Heart Association Task Force on Practice Guidelines; American Association for Thoracic Surgery; American College of Radiology; American Stroke Association; Society of Cardiovascular Anesthesiologists; Society for Cardiovascular Angiography and Interventions; Society of Interventional Radiology; Society of Thoracic Surgeons; Society for Vascular Medicine. 2010 ACCF/AHA/AATS/ACR/ASA/SCA/SCAI/SIR/STS/SVM guidelines for the diagnosis and management of patients with thoracic aortic disease: A report of the American College of Cardiology Foundation/American Heart Association Task Force on Practice Guidelines, American Association for Thoracic Surgery, American College of Radiology, American Stroke Association, Society of Cardiovascular Anesthesiologists, Society for Cardiovascular Angiography and Interventions, Society of Interventional Radiology, Society of Thoracic Surgeons, and Society for Vascular Medicine. Circulation 2010;121:e266-396. Baumgartner H, Bonhoeffer P, De Groot NM, de Haan F, Deanfield JE, Galie N, et al. Task Force on the Management of Grown-up Congenital Heart Disease of the European Society of Cardiology (ESC); Association for European Paediatric Cardiology (AEPC); ESC Committee for Practice Guidelines (CPG). ESC Guidelines for the management of grown-up congenital heart disease (new version 2010). Eur Heart J 2010; 31:2915-57. Stulak JM, Dearani JA, Burkhart HM, Sundt TM, Connolly HM, Schaff HV. Does the dilated ascending aorta in an adult with congenital heart disease require intervention? J Thorac Cardiovasc Surg 2010;140:S52-7. Coady MA, Rizzo JA, Hammond GL, Mandapati D, Darr U, Kopf GS, et al. What is the appropriate size criterion for resection of thoracic aortic aneurysm? J Thorac Cardiovasc Surg 1997;113:476-91. Kuralay E, Demirkilic U, Özal E, Oz BS, Cingöz F, Günay C, et al. Surgical approach to ascending aorta in bicuspid aortic valve. J Card Surg 2003;18:173-80. Yang HH, Kim JM, Chum E, van Breemen C, Chung AW. Effectiveness of combination of losartan potassium and doxycycline versus single-drug treatments in the secondary prevention of thoracic aortic aneurysm in Marfan syndrome. J Thorac Cardiovasc Surg 2010;140:305-312.e2. Dearani JA, Burkhart HM, Stulak JM, Sundt TM, Schaff HV. Management of the aortic root in adult patients with conotruncal anomalies. Semin Thorac Cardiovasc Surg Pediatr Card Surg Annu 2009;12:122-9.